Focus. Speed. I am speed! 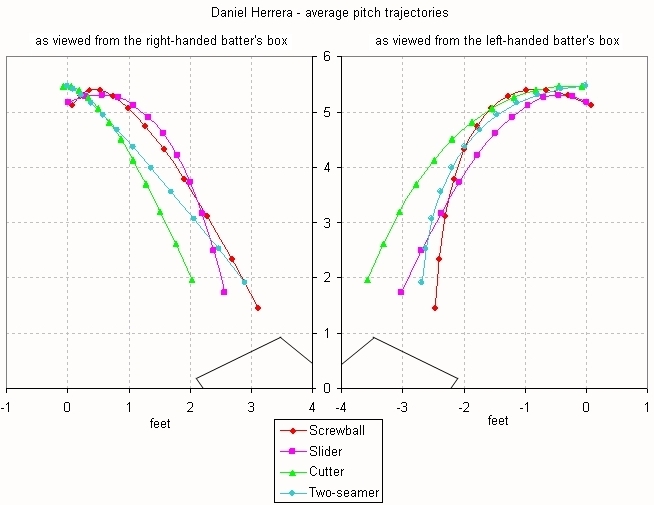 EDIT: I am in the process of working out some data corrections to the PITCHf/x data, and I have updated this post with corrected pitch speed data. 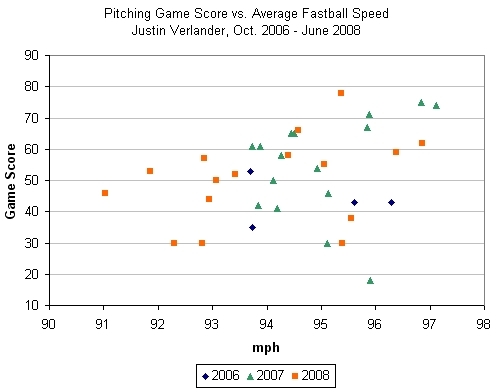 Dave Cameron wrote a piece yesterday at Fangraphs about Justin Verlander’s fastball speed (hat tip to Tango). I love both Dave Cameron’s work and Fangraphs. Fangraphs is quickly becoming one of my very favorite sites on the InterWebs. However, something about Dave’s post today struck me a little funny, and I decided to investigate further. One of the first things we noticed using that data this season was that Justin Verlander’s fastball disappeared in April. He was throwing 91-92 instead of his usual 94-95, and his performance suffered as a result. For all the talk of guys learning how to pitch without their best stuff, Justin Verlander is clearly a better pitcher when he’s throwing 95 instead of 92. 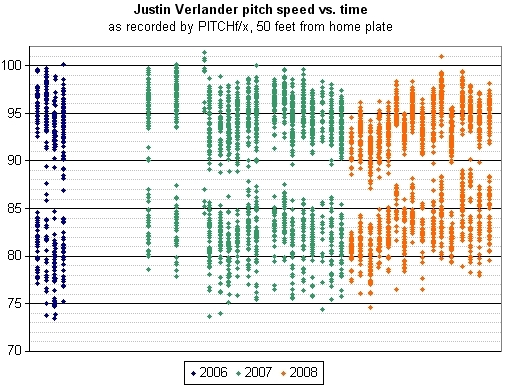 It bugged me because I wasn’t sure it was true, either that Verlander’s fastball speed was improving as Dave said it was, or that there was a correlation between his fastball speed and performance. So I decided to dig into the PITCHf/x data for Verlander. Here’s what we see about his pitch speeds going back to the 2006 playoffs. During the 2006 playoffs his average fastball speed was 94.7 mph. In 2007, PITCHf/x recorded his average fastball speed at 95.0, although the period from which we have most of our PITCHf/x data is after the All-Star break. In 2008, his average fastball speed has been 94.1, and the trend matches fairly well with that which Dave describes seeing in the BIS data. However, I’m not sure I see as direct a correlation between fastball speed and performance for Verlander as Dave Cameron does. I guess you could say he hasn’t pitched any great games with a fastball in the 92-93 mph range, although having a faster fastball does not appear to be a firm guarantee of success. Mostly at this point, I am skeptical of our ability to ferret strong conclusions out of a data set where the sources of error are on the same magnitude as the effects we are trying to measure. My skepticism applies healthily to the BIS data as well as the PITCHf/x data. I have finally gotten around to publishing the 2008 updates to my pitch database parsing scripts. There are new fields available in the 2008 data. The sv_id field is a date-time stamp of when the pitch was thrown, the pitch_type is the MLBAM algorithm’s best guess at the pitch type, and type_confidence is the confidence value associated with that guess. 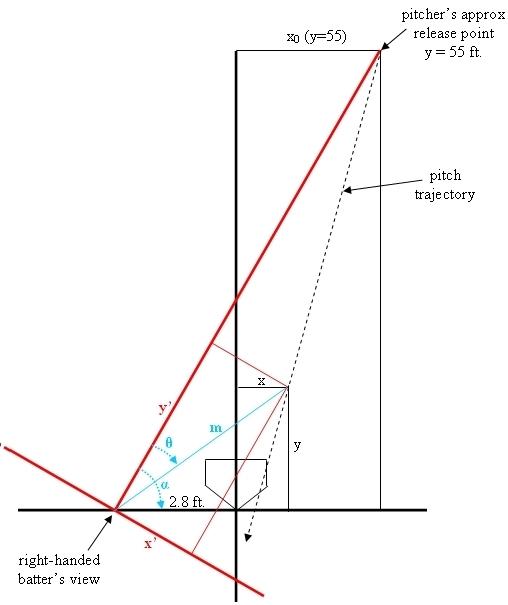 Starting in mid-May, there are also b_height and p_throws fields in the pitch element. I don’t currently use those fields. I get the pitcher throwing hand from the players’ information, and I don’t record the batter height at this time. Here is my new database structure for 2008 with these fields added to the pitch table. You can download the new database parser script to use these fields. I have an additional script to update the pitches table with the ball-strike count at each pitch. I used the time stamp data to look at how quickly pitchers work, and I wrote an article on this topic at The Hardball Times. Several people have asked or been curious about the pitch time data for all the pitchers on their time. Here are the data that I compiled as of June 5. This has nothing to do with anything except me reveling in the things you stumble upon in the PITCHf/x data set. 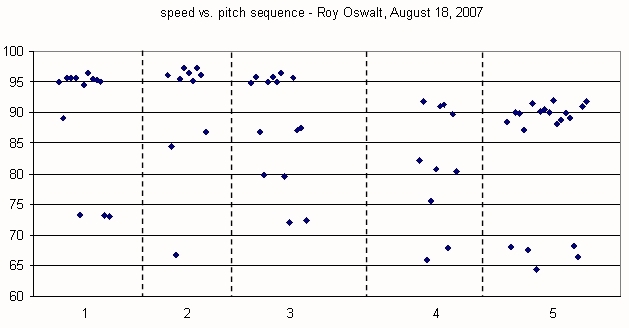 I was looking at some Roy Oswalt data from last year. When I looked at his August 18 start, I noticed he had thrown his fastball at two distinctly different speeds. When do you think Oswalt pulled his left oblique muscle? Oswalt said he first felt something near his rib cage on his last pitch of the third inning, a curveball to Geoff Blum. Oswalt batted with two outs in the fourth and beat out an infield RBI single to give the Astros a 3-0 lead. No revolutionary analysis there, but I thought it was a fun tidbit.